Standard television advertising is the insertion of promotional messages during identifiable advertising opportunities. 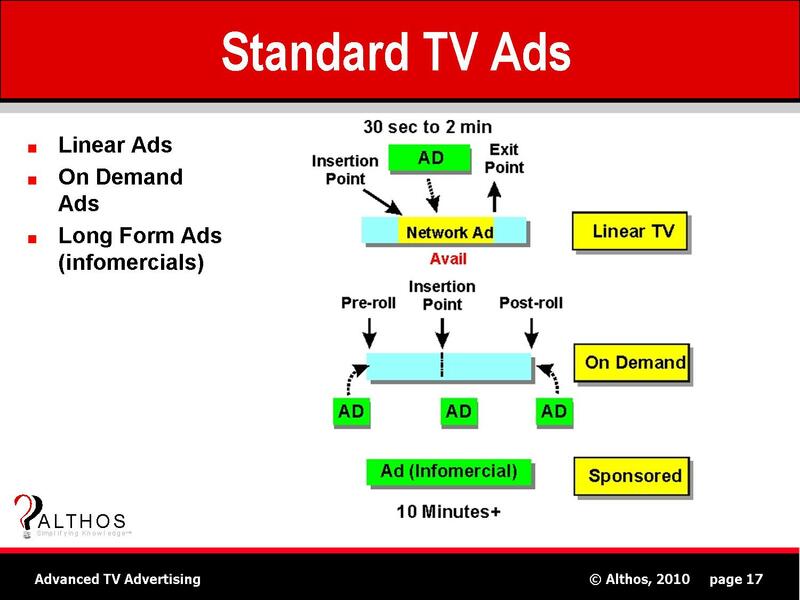 Standard TV ads are often prescheduled media that is inserted within broadcasted programs (linear ads), tied to on demand media, or completely replace programming (long form ads). Linear Advertising - is the inserting of promotional messages into programs that are being transmitted in continuous form (broadcasting or streaming). On Demand Advertising - are media segments that are merged into on demand programming. On demand ads may be inserted before content (pre-roll), after content (post-roll), within content (avails), or after media play control options. Long Form Advertisements - are promotional messages that are longer than the typical available promotional spot (over 10 minutes). This figure shows common types of TV advertising. Linear ads replace existing media within a broadcast channel (such as network ad avails). On demand ads can be inserted before, after, and within on demand viewing sessions. Long form ads become the program.